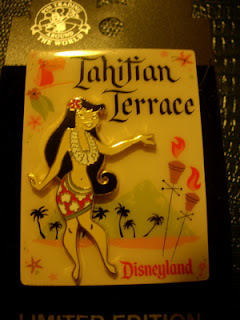 This is a Disneyland Pin from 2004, celebrating the Tahitian Terrace at Disneyland (which no longer exits there now). This pin was designed by famous artist Shag. This pin is a part of a limited edition (of 10,000), and it is part of the Disney Classic Restaurant Series. It is also an Annual Passholder Exclusive.